Hi there. You found our Complete Guide to Facebook Ad Targeting. This is an internal guide we’ve used as a Facebook Advertising Agency to improve our ad targeting and we wanted to make it available so that others improve their Facebook ad campaigns. This guide is available in a high-res infographic and printable PDF version so you can keep it next to you while creating ad campaigns. If you find this guide valuable, please share on social media (use #advertisemint). You’re also welcome to post this guide on your website or blog as a useful resource, all we ask is that you include a link back this page or AdvertiseMint. Enjoy! 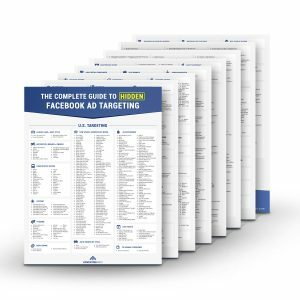 UPDATE: Our new Facebook “Hidden” Ad Targeting Guide is now available for download at the bottom of this page. For the latest Facebook features, marketing tips and tricks or new tools, check out our Facebook Advertising Blog or our Instagram Advertising Blog. UPDATE: On March 28, 2018, Facebook announced that third party data partners will be phased out over the next six months due to the privacy concerns raised by the Cambridge Analytical situation. This means that most of the behavioral targeting and hidden ad targeting options will at some point, no longer be available. You can read more about it online at Facebook to Stop Advertiser Access to Third Party Data or at the official Facebook statement page regarding Shutting down partner categories. Looking for advanced Facebook ad targeting? Did you know there are 2,000+ hidden ad targeting options that can be unlocked for your ad account by Facebook or an approved agency like AdvertiseMint? We compiled an infographic of these hidden targeting options and have made them available for you. Complete the form below to download the guide and take your advertising to the next level.